This guy is really fascinating! Jack Ma, one of my favorite entrepreneurs beside Trump, Steve Jobs, Richard Branson, etc, has a totally different way of looking at his businesses and growing them. Alibaba is definitely one of the most successful internet businesses in China and it can rival eBay and Amazon. If you want to learn more about Jack and his businesses, you can always Google for more about him. What I would like to share with you today would be what I have learned from Jack on his philosophy about creating, growing and maintaining his businesses. As he puts it, “all the successful business leaders out there are very optimistic about the future and the market.” No matter what business you are in, which industry it is, you have to always be positive about the future and the market. You have to always remember this, when the times are bad, there are good companies growing and performing at spectacular results. On the other hand, when the times are good, there are also companies under perform and face bankruptcy. Therefore, it has nothing to do with the future nor the economy nor the market itself. It has more to do with yourself and how you look at the market. Can you imagine that if you are working for Donald Trump and he comes into the office and tells you that the market is bad now and things have really messed up, and it will be the end of the company? Would you still want to work for him or join his company? Of course NOT! People love to work with positive leaders who have great dreams, who are visionary and who always believe in a bright future. Every one of us wanted to be part of something huge, something of visionary, and something cool, right? So start from today, learn to be optimistic and look at the future as bright as possible. You can never succeed with a pessimistic mindset. What is there for you to accomplish when everything you see is just gloom and negative. So change your mindset, and things will change. Whatever happened, always do a check on yourself. What can you do to improve and make the situation better? Always ask yourself and do a post-mortem on yourself. You can only change yourself, you cannot change others. So there’s no need for you to blame the economy or your employees or your shareholders, or anyone else. There’s nothing you can improve or grow by putting the blame on others. Everyone has their own problems. No matter whether you are a teacher, a student, an athlete, a businessman or a soldier, we all have our own problems to solve. The point is that we have to take the responsibility and never put the blame on others. We have to improve ourselves and always be ready to change. If something happened and you complain and you blame, you are actually putting away the opportunity for you to grow. Complain and blaming never work. Not in a million years. So take a look at yourself and change yourself instead of throwing the ball to others. Yes, you got it right; you definitely have to be extremely persistent with what you do. When Jack formed Alibaba, he invited 24 investors into his house to do a partnering business startup. In the end, 23 of them rejected him and only 1 agreed him to try out. However, he never get discourage and quit. Instead he persisted on it and launched Alibaba. There was time when Jack Ma went to the Silicon Valley to raise capital for his e-commerce business too. None of the investors he approached agreed with him on his business idea. All of them thought that his idea will never work. The only person who believed that the idea of Alibaba will work is Jack Ma himself. He believed in his dream and persisted. 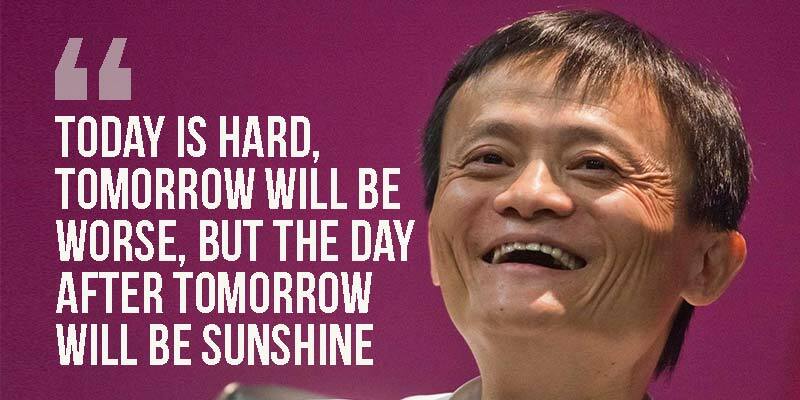 If Jack give up and quit on his idea last time, there won’t be any Alibaba and he would never have listed his company in the US and making it one of the biggest list ever in the US market. A total of $25 billion was raise. Sometimes it is difficult and challenging to persist on your dreams, especially during tough times. You just have to stay longer and tell yourself that you are doing not bad. When tough times come, Jack always tells himself that he is doing okay. Conversely, when the times are good, he will remind himself that he is not that good and there are still a lot of areas for him to improve. This is how Jack grows his business empire, by constantly adjusting his thinking and his way of growing the business. I still vividly remembered what Jack Ma said in one of his talks. He said that don’t study how others become successful, instead, learn how to avoid repeating the mistakes that others have done. To him, there are way too many reasons someone could become successful. And some of the reasons may not be applicable into you. You may not have the ability or you may not have the talent or the skill or even not at the right timing. Hence, it is always better to learn from other people’s mistakes. You learn how NOT TO REPEAT those mistakes so that you can SHORTCUT yourself and become successful faster. Every time Jack receives a case study of a company fails, he would shares with his staffs so that they never repeat those same mistakes. All of us are humans, and we humans tend to make mistakes. There is nothing wrong about making mistakes; it is just that you have to learn how to avoid them whenever possible. This is how you can get to the place you want without much detour. One of the biggest differences between the management style of Jack Ma compared to the majority of the US businesses is this, for Jack, it is always the customer comes first, the employees second and shareholder third. For most companies in the US, shareholder has the number one priority in everything. The founder and the people who run the business have to focus on the shareholder’s interest as shareholders are the ones that come up with the fund. As for Jack, he believes that as long as you take care of your customers and treat your employees well, the shareholder’s interest will take care by itself. There is no right or wrong here and you don’t really have to follow through. This is just a point for you to ponder. Jack Ma always believes in the younger generation. He believes that the younger generations always have more and better ideas. He said it in one of his talks in Hong Kong. He told the audience that whatever you know now, your parents do not know. Come to think about it, my father don’t really understand internet and has no Facebook account. The same would go for you when you get older. Your children will know more than you do. Thus, invest into the younger generation as one day you will get older and become obsolete. And by that time, the younger generation will take over your place. This is not to scare you, but it is just that you have to understand no matter who we are, and we have our own capabilities to bring our business to the next level. We need new and fresh ideas from the young who look at things differently to innovate. No matter who you are, one day your time will past and you will have to pass the baton to the younger generation. It is something that none of us can escape. Can you imagine if you consistently take in young and capable people who dare to innovate and who are more energetic to grow your business together with you, what would happen? This is just a way to enjoy life. What makes Jack Ma to come up with this principle was that a couple of years back when Asian was hit by SARS, he and his team got quarantined in the office for many days. And after he was release, he felt total recharged and should have appreciate life more. From then on, he decided to enjoy and love his life. He started to enjoy all the things he has in life as he said that life is short. And what follow next? Don’t be too serious. Sometimes you just want to enjoy and make fun of your life. This is why he performed in his company event to entertain all his 20,000 employees. Jack never really puts himself as the boss of the company. He is the “down-to-earth” kind of person. He never sees himself as the boss of the company in front of his employees. He even took selfie and has a lot of fun time together with his staffs even though he is the executive chairman. These are some of the powerful insights I have learned from Jack Ma. Well, if you would like to hear him speak, you can always Youtube him for his talks. And I can tell you that it will be time well spend.